LOS ANGELES, California (CNN) -- Music producer Phil Spector was sentenced Friday to the maximum sentence of 19 years to life for the murder six years ago of actress Lana Clarkson. 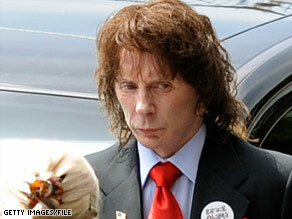 Phil Spector's first murder trial in 2007 ended in a mistrial as jurors said they couldn't reach a verdict. That means Spector, 69, would be 88 before he would be eligible for parole. Slumped, stone-faced and wearing a dark suit and bright red tie, he sat silently throughout his sentencing by Judge Larry Paul Fidler. Spector's lawyer gave a $17,000 check to Donna Clarkson, the victim's mother, to pay for her funeral expenses -- part of the court-ordered sentence. "All of our plans together are destroyed," the mother said, reading a statement on behalf of her family. "Now, I can only visit her at the cemetery." Fidler denied a motion for a new trial by defense attorney Doron Weinberg, who said he would file an appeal. "Obviously, he's not very happy," Spector's wife, Rachelle, told reporters about her husband. "I'm going to stand by him and get him out of that awful place so he can come home where he belongs." DA: Who buys shoes, then commits suicide? Spector's trial, which began in October, ended last month when jurors deliberated for 30 hours and then announced a guilty verdict on the second-degree murder charge. Fidler had ruled jurors also could consider the lesser charge of involuntary manslaughter. Spector's first murder trial in 2007 ended in a mistrial as jurors said they couldn't reach a verdict after 15 days of deliberations. Jurors then were deadlocked 10-2 in favor of conviction. Fidler declined to allow Spector to remain free on bail pending sentencing, citing Spector's years-long "pattern of violence" involving firearms. "This was not an isolated incident," Fidler said, noting Spector's two firearms-related convictions from the 1970s. "The taking of an innocent human life, it doesn't get any more serious than that." Do pointed out to jurors, however, that Clarkson had bought new shoes on the day of her death -- something he said a suicidal woman would not have done. Clarkson starred in the 1985 B-movie "Barbarian Queen" and appeared in many other films, including "Deathstalker," "Blind Date," "Scarface," "Fast Times at Ridgemont High" and the spoof "Amazon Women on the Moon." She was working as a VIP hostess at Hollywood's House of Blues at the time of her death. In the 2007 trial, Spector's attorneys argued that Clarkson was depressed over a recent breakup and grabbed a .38-caliber pistol to kill herself while at Spector's home. But prosecution witnesses painted Spector as a gun-toting menace. Five women took the stand and testified that he had threatened them with firearms. His driver testified that he heard a loud noise and saw the producer leave the home, pistol in hand, saying, "I think I killed somebody." Spector's professional trademark was the "Wall of Sound," the layering of instrumental tracks and percussion that underpinned a string of hits on his Philles label -- named for Spector and his business partner, Lester Sill -- in the early 1960s. The roaring arrangements were the heart of what he called "little symphonies for the kids" -- among them No. 1 hits like the Ronettes' "Be My Baby" and the Righteous Brothers' "You've Lost That Lovin' Feelin'." Spector co-produced the Beatles' final album, "Let It Be," and worked with ex-Beatles George Harrison and John Lennon on solo projects after the group broke up. His recording of Harrison's 1971 benefit concert for war relief in Bangladesh won the 1972 Grammy award for album of the year. That was one of two Grammy Awards won by Spector, who was inducted into the Rock and Roll Hall of Fame in 1989. He stayed out of the public eye for two decades before his 2003 arrest in Clarkson's death.